US airliners'n'armaments colossus Boeing announced today that one of its prototype aerial laser cannon planes has fired its first energy bolts in ground testing. "First firing of the high-energy laser aboard the ATL aircraft shows that the program continues to make good progress," said Boeing blast-cannon biz boss Scott Fancher. The secret raygun project couldn't resist a hint as to where they got their new technology. The so-called Advanced Tactical Laser (ATL) programme is one of two flying raygun projects underway at Boeing. The other is the Airborne Laser, or ABL, a monstrous jumbo-jet mounted energy ray intended to disintegrate threatening nuclear missiles from hundreds of kilometres away. Both ATL and ABL use toxic chemical fuels to generate higher-intensity laser beams than can currently be produced by electric equipment. The ATL, rather than frying hostile ICBMs from across a country, is seen more as a ray-cannon for everyday tasks. Relatively handy at 20 tons all up - the sealed chem-laser module itself weighs six tons, the rest being aiming gear, controls etc. 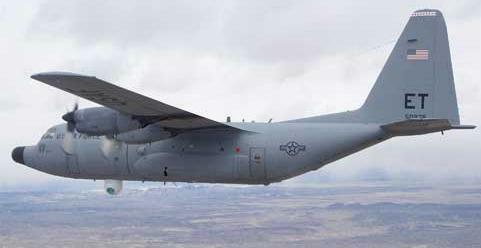 - the ATL can be fitted into a normal C-130 military transport rather than needing a jumbo. Drawing a comparison with existing C-130-based "gunship" aircraft, which fire a broadside of ordinary projectile cannon against ground targets, Boeing have previously dubbed the ATL the "Laser Gunship". The Laser Gunship, if it performs to spec, is expected to take out targets such as individual vehicles or cellphone towers, silently and from as far as 18-20km. People in the vicinity of an ATL strike might not realise what had happened until well after the event, if at all. This could be especially handy for Boeing's initial customer - the US military's secretive Special Operations Command. Following last week's successful ground firings with the raygun now mounted in the plane, Boeing expect to go for a flight test in the coming months. At that point, the US military will decide whether the kit is good enough to take into service. RoTM Unarmed, but let's be real – it's only a matter of time, isn't it? Boeing slams $2m on the desk, bellows: Now where's my jetpack? Analysis Have you seen how dependent our armed forces are on them?